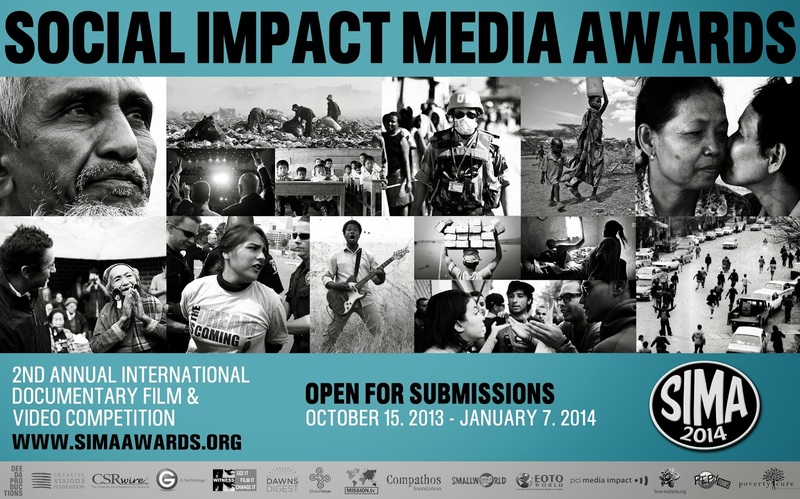 Now in its second year, SOCIAL IMPACT MEDIA AWARDS or SIMA, a global documentary and educational impact media competition and showcase honoring members of the independent film and global humanitarian industries. Dedicated to advancing global awareness, social justice, human rights, and humanitarian development, SIMA champions the works of independent FILMMAKERS, ACTIVISTS, and CHANGE-MAKERS, amplifying creative media that exemplifies excellence in its potential to inspire change. Invited are all international DOCUMENTARY FEATURES and SHORTS that provide deeper insight into the realities of global development, global activism, and the human condition, as well as EDUCATIONAL IMPACT VIDEOS that illuminate "How Aid Works", i.e. the process behind innovative development programs. visit the SIMA website or find them on Facebook / Twitter.